Pelota in Spanish, pilota in Basque and Catalan, or pelote in French (from Latin pila) is a name for several court sports played with a ball using one's hand, a racket, or a wooden bat (pala), against a wall (frontón in Spanish, frontoi in Basque, frontó in Catalan) or, more traditionally, with two teams face to face separated by a line on the ground or a net. Their roots can be traced to the Greek and other ancient cultures, but in Europe they all come from real tennis (see Jeu de paume). Today, Basque Pelota is widely played in several countries: in Spain and France, specially in the Basque Country and its neighbour areas. 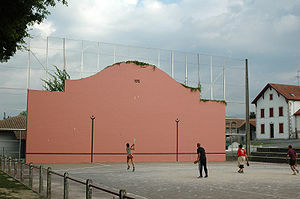 Pelota vasca in the Spanish-language Auñamendi Encyclopedia, with sections on the game and history. This page was last changed on 3 July 2018, at 05:53.